* Full online access to the lecture recording and related downloads is granted to all ticket holders. *Full online access to the lecture recording and related downloads is granted to all ticket holders. Finally, a worthy and welcome approach that supersedes the unreliable old world model of setting key leads with down weights. The most simple, comprehensive, and time saving system for creating reliably perfect touch with replacement hammers. Stanwood's Coded Key Weighting™ scales use stock or customized key weighting specifications that give a whole new meaning to key balancing. Key leads are installed once and for all in each key with digital scale accuracy. Install them yourself or send the keys to a key balancing service provider. Measuring down weight and up weight with sample hammer weights on just a few test notes determines the stock or customized Hammer Strike Weight scale that balances the whole action. The Stanwood SNAP!™ method automatically matches hammer weight and action ratio to create any desired dynamic inertial playing type. Stanwood SNAP!™ does not require the need for a computer. The action is balanced to the desired level of accuracy by adding or subtracting hammer weight to make the Hammer Strike Weight Scale specifications with digital scale accuracy. Learn how to order hammers of the right weight level from suppliers for the least work. INVENTED THE ADJUSTABLE LOW INERTIA JACK USING HIS DESIGN WHICH ELIMINATES THE SCREW AND BUTTON ON THE JACK. THE BUTTON IS MOUNTED ON THE SPOON AND ADJUSTMENT IS ACHIEVED BY BENDING THE JACK WITH A MODIFIED SPOON BENDER. INVENTED THE HARD ANODIZED ALUMINUM CAPSTAN FOR REDUCING WEIGHT AND FRICTION AS WELL AS ELIMINATING OXIDATION ISSUES ASSOCIATED WITH BRASS. LATER ADOPTED BY MASON & HAMLIN. PUBLISHED "MASTERING FRICTION WITH THE BALANCE WEIGHT SYSTEM" WHICH ACCOUNTS FOR AND CORRECTS ERRORS IN THE KEY WEIGHTS CAUSED SETTING EVEN DOWN WEIGHT WITH UNEVEN FRICTION. COINED THE TERMS BALANCE WEIGHT AND FRICTION WEIGHT. PUBLISHED "THE NEW TOUCHWEIGHT METROLOGY" AND DESCRIBED HIS EQUATION OF BALANCE WITH NEW METHODS FOR MEASURING AND CALCULATING “TOUCH DESIGN COMPONENTS”- A NEW CONCEPT. HIS NEW MEASURES INCLUDE: STRIKE WEIGHT WHICH ALLOWS FOR HAMMER WEIGHT TO BE MEASURED “ON THE SHANK”. FRONT WEIGHT WHICH DESCRIBES THE PRECISE EFFECT THAT LEAD WEIGHTS IN THE KEY HAVE ON DOWN AND UP WEIGHT. WIPPEN WEIGHT WHICH DESCRIBES THE WEIGHT ON THE CAPSTAN FROM THE WIPPEN. KEY WEIGHT RATIO WHICH DESCRIBES HOW THE WIPPEN WEIGHT TRANSLATES TO AN UPWARD FORCE AT THE FRONT OF THE KEY. TWO IMPORTANT CALCULATED VALUES ARE DESCRIBED IN THIS PUBLICATION: TOP ACTION BALANCE WEIGHT- THE SUM OF FRONT WEIGHT AND BALANCE- DESCRIBES THE TOTAL UPWARD STATIC FORCE AT THE FRONT OF THE KEY RESULTING FROM THE LEVERAGED WEIGHT OF THE HAMMER AND WIPPEN. STRIKE WEIGHT RATIO - THE AMOUNT OF WEIGHT AT THE FRONT OF THE KEY TO BALANCE A GRAM OF HAMMER WEIGHT. THE NEW TOUCH WEIGHT METROLOGY - NOW KNOWN AS SIMPLY TOUCH WEIGHT METROLOGY SPAWNED A RANGE OF NEW METHODS FOR ANALYZING, AND IMPROVING AND CUSTOM DESIGNING THE WAY PIANOS FEEL AND PLAY . STANWOOD RECEIVED HIS US PATENT #5585582 FOR CALCULATING KEY BALANCING SPECIFICATIONS WITH THE EQUATION OF BALANCE. INCORPORATED HIS BUSINESS AS STANWOOD PIANO INNOVATIONS INC. PUBLISHED "STANDARD PROTOCOLS OF THE NEW TOUCHWEIGHT METROLOGY" WHICH GIVE UPDATED TOUCH WEIGHT METROLOGY PROTOCOLS AND DEFINITIONS. DESCRIBED A NEW METHOD FOR ISOLATING AND MEASURING FRICTION IN THE KEYSTICK AS WELL AS A METHOD FOR HOW TO MEASURE THE CONTRIBUTION OF SUPPORT SPRINGS IN LOWERING BALANCE WEIGHT. PUBLISHED "LOOKING AT GRAND PIANOS THROUGH THE EYES OF THE NEW TOUCHWEIGHT METROLOGY" AND DESCRIBED HIS TIME TESTED STRIKE WEIGHT SCALES THAT DELINEATE HIGH, MEDIUM, AND LOW ZONES WHICH MAKE IT POSSIBLE TO RATE AND QUALIFY HAMMER WEIGHT LEVELS IN PIANOS. DESCRIBED FOR THE FIRST TIME, IMPORTANT ISSUES SUCH AS COMMONLY FOUND JUMPS AND BUMPS IN MEASURED STRIKE WEIGHT SCALES WITH ATTRIBUTED CAUSES. ADVOCATES THE NEW CONCEPT OF SMOOTHING STRIKE WEIGHTS AS A VIABLE METHOD FOR IMPROVING TONE AND TOUCH. ALSO PUBLISHED HIS FINDING THAT WORKING ACTION RATIOS ARE NOT GENERALLY 5:1 AS WAS COMMONLY THOUGHT. HIS FINDINGS SHOW THAT RATIOS OF 6:1 ARE MOST COMMON AND NORMAL RANGE FOR RATIOS IN THE MODERN PIANO IS FROM 5:1 TO 7:1. HE ALSO SHOWED HOW KEY LEADING AND ASSOCIATED FRONT WEIGHTS ARE WILD AND CHAOTIC IN PIANOS AND PUBLISHED HIS “FRONT WEIGHT CEILING”SCALE. THIS GUIDING SCALE OFFERS A MEASURE OF HOW MUCH LEAD IS TOO MUCH LEAD. ABOVE THE CEILING BEING TOO MUCH. PUBLISHED "COMPONENT TOUCHWEIGHT BALANCING - BLUEPRINT FOR THE FUTURE" IN WHICH IS OUTLINED HIS FIRST VISION OF A BETTER PIANO WORLD BY LOOKING BEYOND THE OLD WAY OF SIMPLY PUTTING LEADS IN KEYS TO MAKE EVEN DOWN WEIGHT TO DESIGNING AND INSTALLING SMOOTH SCALES OF STRIKE WEIGHTS AND FRONT WEIGHTS IN ORDER TO PRODUCE DESIRED DOWN WEIGHT, BALANCE WEIGHT, AND UP WEIGHT LEVELS AS WELL AS A SPECIFIC DYNAMIC PLAYING QUALITY IN THE FINISHED PIANO. STANWOOD SHOWS HIS ADJUSTABLE LEVERAGE ACTION AT THE PTG NATIONAL IN GRAND RAPIDS, MICHIGAN. DAVID STANWOOD, FRANS PIETJOUW, AND WIM FELDHAUS ESTABLISH THE PRECISION TOUCH DESIGN ACADEMY EUROPE AKA PTDAE BASED IN HOLLAND FOR DEVELOPING SOFTWARE AND TRAINING FOR INSTALLATIONS OF STANWOOD’S TRADEMARK PRODUCT “PRECISION TOUCH DESIGN”IN EUROPE. PRODUCES HIS CHART OF TOUCH DESIGN ELEMENTS AND SIMPLIFIED COMPUTER FREE METHOD FOR BALANCING GRAND PIANO ACTIONS WITH STANDARDIZED STRIKE WEIGHT AND FRONT WEIGHT SCALES. "It's amazing what David has done with this piano. The uncanny thing about it is that I seem to be able to play all this stuff that I'm normally not able to play with quite as much facility. It just helps me to express the ideas that I'm thinking and they just come right out." My hat is off to David—an authentic genius. I shall never forget my experience playing his Magical Mason & Hamlin grand. exotic dynamic was preordained by a master hand. That hand was David Stanwood. He is a blessing to the noble art of music. instrument as a "Stanwood-Steinway". It is more than a perfect piano - it is the best of the past and future of all pianos. David Stanwood is a national treasure. Piano music has entered a new frontier of expression." Gary Hadfield had his prized vintage Bechstein Concert grand rebuilt but then it was worse than even before! John Callahan of Callahan Piano Service in Oakland California describes the effect that Precision TouchDesign has had on his business. Owner of a 10 year old Fazioli realizes the connection between the action and piano technique. "The weight you use is the sound you get,"
This internationally renowned veteren Concert pianist has had many positive experiences performing on pianos upgraded with Precision TouchDesign. He recently had his primary practice piano in his own home upgraded with PTD. Piano owner in Stanford, California wasn't happy with the work done on her Steinway. After treatment with Precision TouchDesign she says: "the action is totally even, responsive and smooth as silk. The sound is incredibly beautiful, the voicing perfect." The founder of Pro Piano, North America's largest independent purveyor of concert grand pianos, comments on Stanwood's work. "Why I love your piano"
The renowned concert pianist of Boston comments on his extensive experience. Director of the Schaffhausen Conservatory of Music, Schaffhausen, Switzerland. Renowned pianist, Blues artist, and namesake of Ray Charles comments on his Stanwood experience. Arm pain and added expense made his dream piano a nightmare. Professional jazz pianist - His 5 year old Steinway D was too heavy for him to play comfortably. Director of the Longy School of Music endorses Stanwood Touch Designs. Professional pianist - discusses his remarkable experience of practicing on a Stanwood Touch Design then performing on a Stanwood Touch Design. 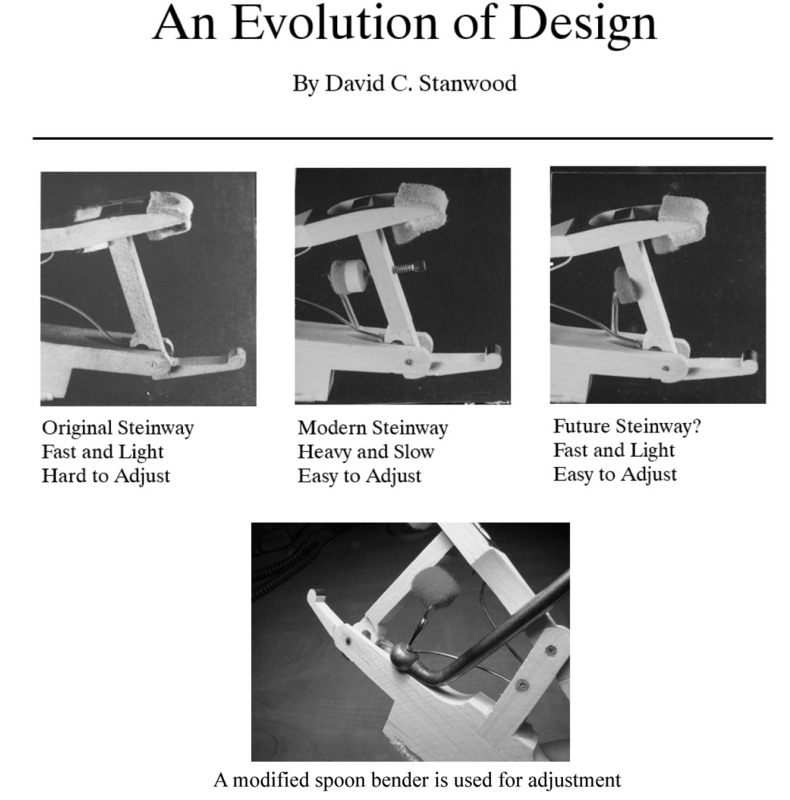 Describes how the Stanwood Touch Design System helped her recover from stress injury. This professional jazz pianist, was ready to scap his rebuilt Steinway Concert Grand. Now it's his pride and joy. A Steinway Artist who travels the world performing on many different concert pianos. 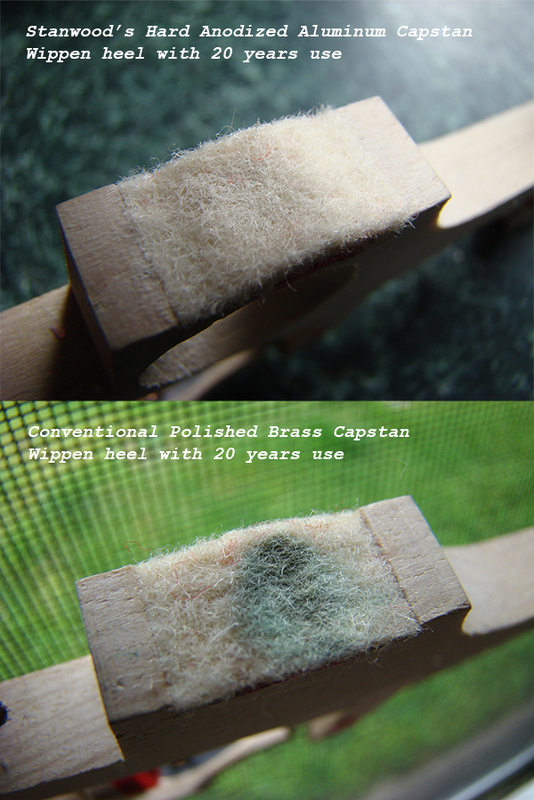 Comments on his experience with Stanwood Touch Design installed on his own piano. at the Marlboro Music Festival. *CAN'T MAKE THE LIVE LECTURE? Full online access to the lecture recording and related downloads is granted to all ticket holders. You won't pay for lodging. You won't pay for flights to far off locales. You won't lose potential income generating time while traveling. priceless information, all kept in one place, that will give you the confidence to implement your new skills. How much faster could you learn and apply these concepts if you had the support of a worldwide community exclusively focused on each lecture topic? For each previous lecture we've conducted a thorough surveys afterwards. Here's what we learned when we asked "How much could one lecture's content increase your income in the next 12 months?" A full 91.7% of participants surveyed predict earning extra income because of one lecture. Double, triple, 10X or 100X your investment. The Piano Technicians Masterclasses are a new series of advanced, high quality, in-depth, interactive training seminars offered to the discerning piano technician. Each unique lecture is hosted by a recognized expert in the piano industry, who is not only experienced in practice but who is also a dynamic and successful educator.